It was a win-win situation for Therese Cacek, the winner of the first ArtsConnectEd iPad Challenge. She had been trying to come up with a lesson that would inspire her 6th grade art students at Holdingford Elementary, a little less than 2-hour’s drive northeast of Minneapolis, to use the ArtsConnectEd website as part of an assignment to learn to use Photoshop Elements. You can view Therese’s winning Set “Minnesota Museums Tour” on ArtsConnectEd. While you are at it, take a look at the honorable mention Set “Photograms: A Cameraless Image” by Edina High School photography teacher Kim Raskin. With ArtsConnectEd, users can not only access over 20,000 works of art and resources from the Minneapolis Institute of Arts and the Walker, they can use the materials they find to build customized Art Collector Sets, save them, and share their work with others. Building an Art Collector Set is fun, but it is also a perfect lesson planning tool for teachers. The iPad Challenges are incentives for teachers and other users to produce outstanding Sets and share them with all ArtsConnectEd users. The next round of the ArtsConnectEd iPad Challenge is underway. Any K–12 teacher, active substitute teacher, home school educator, teaching artist, student teacher, and college education major is eligible to win an iPad. Just submit an original Art Collector Set that is relevant to a lesson plan by midnight January 7, 2011. You could be the next ArtsConnectEd iPad Challenge winner! 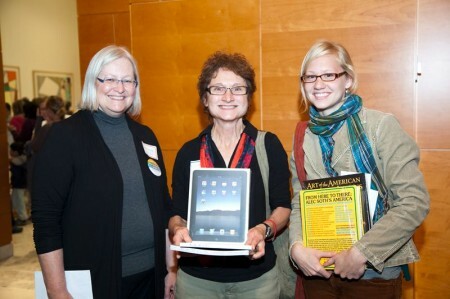 ArtsConnectEd iPad Challenge #1 winners Therese Cacek (center) and Kim Raskin (right) with Susan Rotilie at the Minneapolis Institute of Arts Educators’ Evening October 21, 2010.